Cranes & Hoists Overhead Cranes, Jib Cranes | KMH Systems, Inc.
Free Standing Work Station Bridge Cranes can handle the toughest overhead lifting tasks. These cranes, which can be installed on any normal 6-inch reinforced concrete floor, feature a pre-engineered modular design that can easily expand as your work centers expand. When a work area must be free from any support structures that may interfere with operations, Ceiling Mounted Bridge Cranes are an excellent solution to keeping floors clear. These systems are designed for easy installation and, expansion and relocation. Bridge lengths from 4 ft. to 34 ft.
We also offer pre-engineered Floor Supported and Ceiling Mounted Crane Systems in capacities from 1/2 ton to 50 tons & spans up to 100’. These systems are made with track, which has a three piece welded construction with a compound section of mild steel top flange and web and a specially rolled high-carbon steel lower rail. They’re known for consistently straight rail sections and durable, high quality components. These systems offer unmatched versatility, durability and ease of installation. Work Station Jib Cranes are the ideal substitute for traditional, heavy I-Beam jib cranes. These jibs are designed to service circular areas and support tool balancers, air balancers, vacuum lifters and hoists. When column or wall mounted, they can handle up to a 200° rotation. When floor mounted, they can accommodate up to a 360° rotation. Capacities available from 100 lbs. to 1000 lbs., spans to 16’. 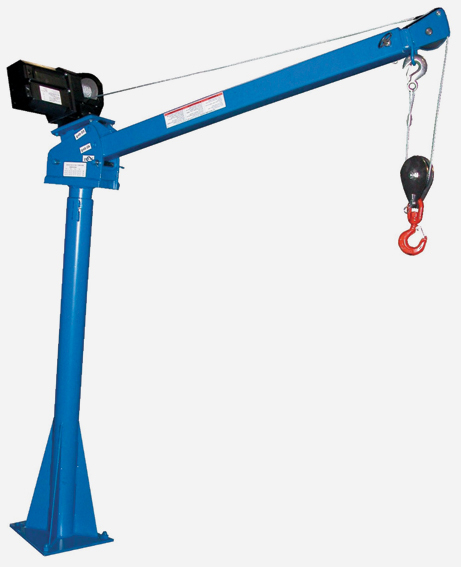 This versatile crane can move loads around corners, reach into machines or doorways, and swing under obstructions. This crane is also perfect in applications that require an operator to rotate the jib in close to its pivot point. Capacities from 150 lbs. to 2000 lbs. with spans up to 16 ft. Available in free standing, ceiling and wall mounted.